I got a tassimo for Xmas and this is by far and away the cheapest pod holder I could find. These are going on amazon for over a tenner. uhm you sure they work for tassimo? they don't look like they would. 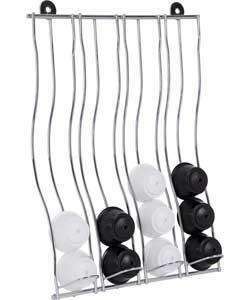 These look good but doesn't look like the tassimo pods would fit, anyone know as there are no reviews? Gotta have somewhere secure for your pods, for sure. It looks like a nespresso holder to me. Hmm might be mistaken on the tassimo front then apologies if I am. I've hunted for reviews and can't find anything definitive. I bought the other one from Argos as this seemed to small for Tassimo when I looked at it ????!!?? I've got to go to argos today. I'll take a pod down with me and try it. Argos Q&A for the product includes the response that Tassimo discs will fit. UPDATE: Seems the above link won't work for some reason. You can access it by scrolling down the Argos product page until you get to the product description, on the right is the Question and Answers link. Nice one, I'm thinking about getting 2 and having them free standing back to back. If it'll work. any news on if they fit the tassimo pods yet. Tassimo discs don't fit, I took one with me to Argos to check. Can confirm that is does not work with tassimo discs. Didn't go to the trouble of taking one instore after reading it would fit on Q&A so now have the hassle of taking it back. The one that is 6.99 has lots of reviews saying it does fit them but of course none of these instock anywhere so will be looking elsewhere I guess. Any suggestions? The OP posts this deal without purchasing it, indicates it works with Tassimo pods, people have then since bought one in error thinking it will work and the description on the Argos website doesn't even have any mention of Tassimo!! Deal posting newbie! This is Lurker83 first deal post. Help out by leaving a posting tip or just to show your appreciation for their contribution.